I've had this skirt design in mind for a while now and with the warm weather coming, now seems the perfect time to show a little leg and put some wiggle in my walk. With this skirt you'll certainly be swinging your hips and swishing your hemline at every opportunity. It's fitted to your body in the waist and hips because most of us feel like we don't need to extra volume there. Then the skirt flares out to give you a great full hemline. Fabric needed for all sizes – 1 and 2/3rd yards, assuming 54 inch wide fabric and a finished skirt length of 20 inches. My salmon pink skirt is made from a cotton jersey and the print is an ITY knit. Both are nice, but the ITY is my favorite, the fabric drapes nicer than the cotton knit and you get more softly flowing curves to the skirt. Start by downloading the pattern file from Craftsy. 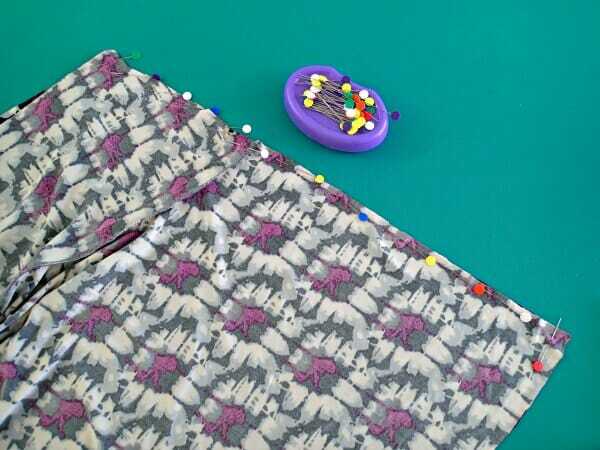 This includes the basic info about the pattern and the pattern pieces you'll need for this skirt. Assemble the pattern and use your tape measure to measure the widest part of your hips – usually around 6-8 inches down from your waist, but may vary. Take note of this measurement and check the size chart. Cut your pattern to match the size of your hips. You can either cut your pattern out or trace it. Here you can see me using both options. Tracing your pattern might be a good option if you plan to make the skirt in different lengths or sizes, one for you, one for your daughter perhaps. NOTE – the finished length on this skirt is 20 inches, including a 1/2 inch hem allowance. 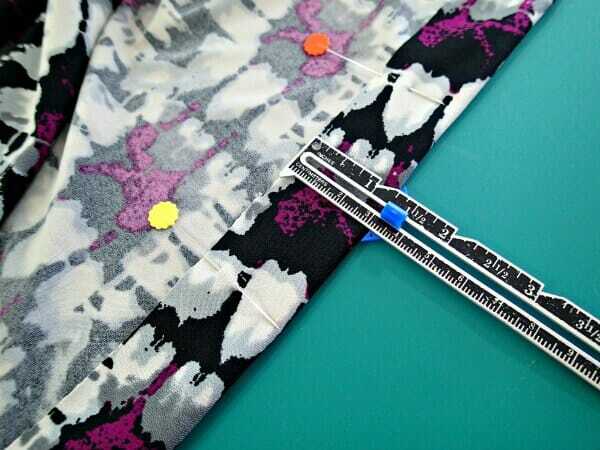 If you want to make it longer or shorter, adjust your pattern piece before cutting out – use the outer circle hemlines as a guide to lengthen or shorten. 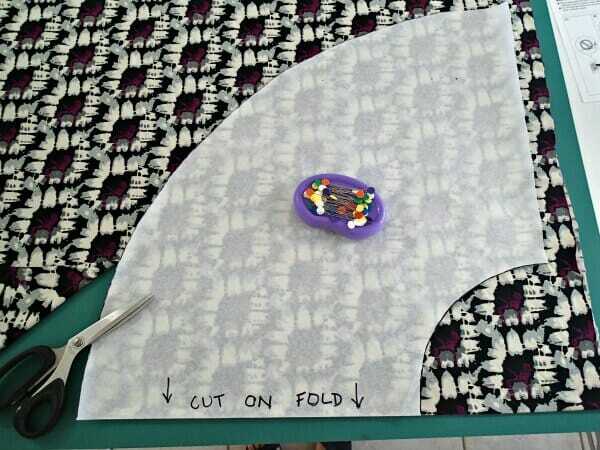 Fold your fabric and place the edge of the pattern on the fold where shown. Cut two top pieces and two bottom pieces all on the fold of your fabric. 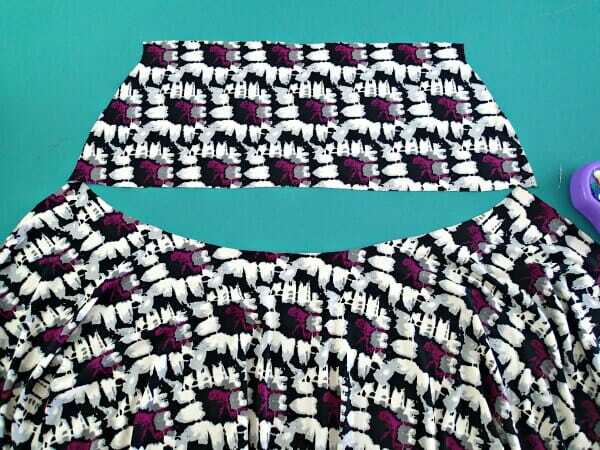 Good news – this is really quick, just a few seams and you'll be ready to wear your skirt. There isn't a back and front, just a top and bottom. Take one top piece and match it right sides together with the bottom flouncy piece. Mark and match the centers of each piece, then the edges and ease the flounce to fit the top piece. Pin and then stitch using a stretch stitch or a narrow zig-zag. A half inch seam allowance is included. Use your serger or trim and neaten your seam – try using an overcasting stitch on a regular sewing machine. Repeat for the other 2 pieces. You can already see the pretty shape of the skirt. Join the side seams. Match up the top, bottom and the seam line and pin, then sttich and finish the seam as before. Take some elastic and test it for size around your waist until you are happy with the comfortable fit. 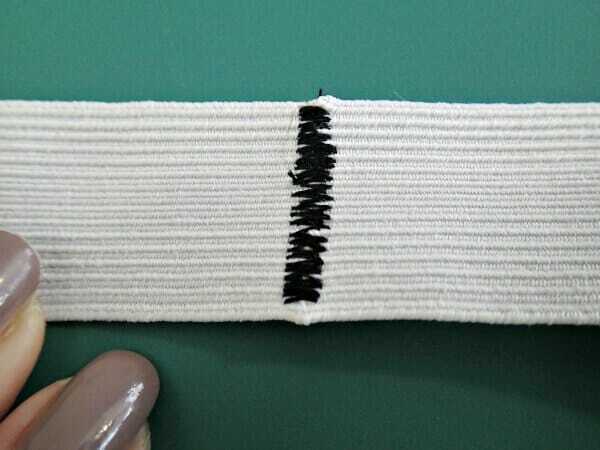 Cut the elastic to length. 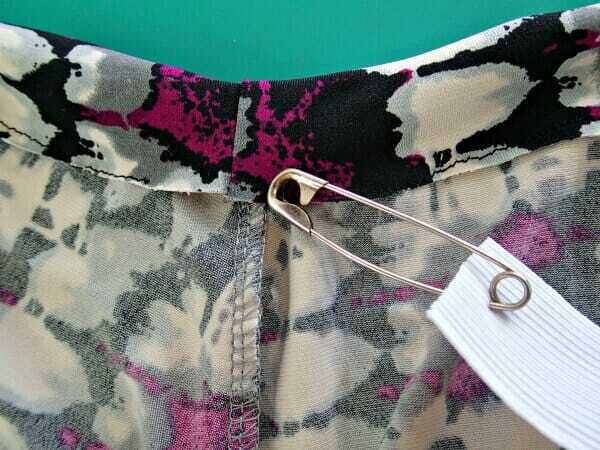 Add a large safety pin to one end and feed the elastic through the casing, taking care not to twist it. When you have both ends through, place the elastic ends side by side and zig-zag them with a wide stitch to join the elastic. Pull it fully into the casing and then close the gap in the casing. Try on your skirt and check it for length. Turn up 1/2 inch to the wrong side and finish your hemline with a twin needle finish, or your favorite finish for knits. Wear your skirt and flounce and bounce and twirl about. Made one in a print, you'll probably want to make another in a solid too. Such a quick and fun skirt to sew and wear. For the first 6 to 7 seven months and after giving birth, I think yes. Hi, is the skirt one length all round? The photos look like it’s longer on one side than the other. yes it is the same all around. I have now made 3 of these! This was so easy to make and I love it so much. I used cotton quilting fabric, added a zipper, and added a little elastic to keep it up because it was a little too big. I’m a lightly skilled beginner and this was right in line with my skills! I will be making another. Love this! I made 2 of these and am planning more. Perfect fit, great instructions and pictures. Fabulous skirt! I made it in plain black jersey to wear over my cycling shorts and it works great. Lots of compliments. Now I am thinking of another in a print. Can you load a picture love to see it! Quick question, I am excited to make this skirt for myself but know my little girls will want one too. How can I alter the pattern down to sizes 2T, 4T and size 6 in little girls? It would be so sweet on them and they would love for all of us to have matching skirts!! Deby, coming from a woman (me) who wears skirts 90% of the time and sews most of them, I have to commend you on the perfect skirt pattern. This skirt is my all time favorite, it has it all – ease of construction, flattering silhouette, swing, and bounce! Thank you very much for offering this skirt for free. Has anyone used this to make a running skirt? You could just wear over bike shorts. I haven’t done it, but what a great idea! I would imagine all you’d have to do is maybe make it a little shorter? Love this skirt, I will add a little extra length, otherwise just what I am looking for for a summer wedding that is taking place at the golf course. Such a cute skirt!!! I have some gray fleece, and I’ve been thinking of making a skirt out of it – I’m not much of a pants girl, but the idea of a cute fleece skirt with tights (it’s still cold here in Michigan!) really appeals to me. This will be my first serger project!! Do you think that fleece would work for this? (It’s a blanket fleece, NOT a sweatshirt fleece with a flat side.) Thank you!! Hey Deby, do you think this style would good floor length? I think this would look amazing as a floor length. With the fitted yoke and then the added flare as you go down, wow, would be stunning. It would take a lot of fabric though! I hope you’ll give it a try and let us see how you get on. Just made this for my niece for a quick skirt for her trip. Thank you!!! you saved me alot of headache. Now I need to try for myself. It’s really up to you Angela. I’m just suggesting what I think is the easiest way, but if you prefer to sew the yoke pieces and the skirt pieces separately into circles and then join them in the round, you can do that too and you’ll get the same end result. 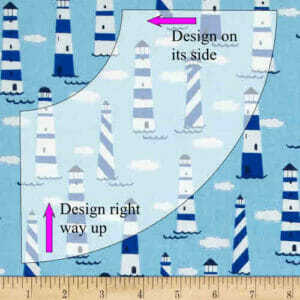 i have one dress design.can you give the instruction to make that pattern? Thank You! I’m sorry but I don’t have the time to do custom dress designs for people. Pattern designing isn’t something that is quick to learn either. May I suggest the pattern designing classes on Craftsy? You can read about them in this article – https://so-sew-easy.com/craftsy-pattern-drafting-classes-exclusive-offer/ Good luck with your dream dress. Great little swingy skirt! Thank you so much for sharing this pin on the P3 party Board! We loved it and it will be featured on the blog and my social media tomorrow! So look for a little traffic from me! You are a star Kim, thanks so much for the feature. Love the shape of this skirt! Thank you for the pattern. Would you recommend a medium weight for the ITY knit? Yes I think medium. Anything too thick and heavy won’t have the same soft drape, and some of the really light weight ones tend to be a bit see-thru in the right light! I hope you’ll share it with us when you get done. Beginning sewer here. This skirt is adorable and looks fairly easy for someone like me. Do you have to use any special stitches or techniques for stretchy fabric? I think I’ve only ever used calico and basic cotton fabrics. A very flattering skirt, Deby!!! I am thinking of waiting for my Janome Coverpro machine to arrive and try out the coverstitch on the skirt. I will post my finished work when I’m done. Wonderful, I’m really looking forward to seeing it. Wonderful Val, I’m looking forward to seeing it. Lovely hang to this one. This looks like the project I need to 1) make my first skirt 2) trying sewing with knit. I’m soo excited! I’ve got some pretty printed knit I bought in hopes I’ll make something out of it one day. This will be perfect for the weather here in Southern California, thank you! Good to hear Julie. Looking forward to seeing how you get on. Do come share with us in the sewing chat room when you have it done. I’m still waiting to see the first one completed. Thanks so much for this skirt pattern. Really looking forward to make the skirt. This is exactly the style of skirt I have been formulating in my head for a couple of weeks. I was going to draft my own pattern, but you saved me the bother. I will need to add 6″ to the length, because (a) I have very long legs, and (b) I don’t like my skirts above the knee (prefer them to just skim the bottom of my knee). I can’t wait to get started. Thanks for the pattern! Perfect timing them Jeannie. Should be easy enough to add to the length, just extend the botton of the circle 6 inches all around. You’ll need extra fabric…Will you share when you are done? I’d love to see what you made. Hi Deby, I have trouble sewing with Jersey material on my Janome machine the thread catches underneath and the spool thread breaks, any suggestions? Hmm, hard to say. Maybe the needle? Sometimes it just needs a change from ball point to stretch needles or vice versa. Drop into the sewing chat group and leave some details and we can all hash it out there with some ideas for solutions for you. 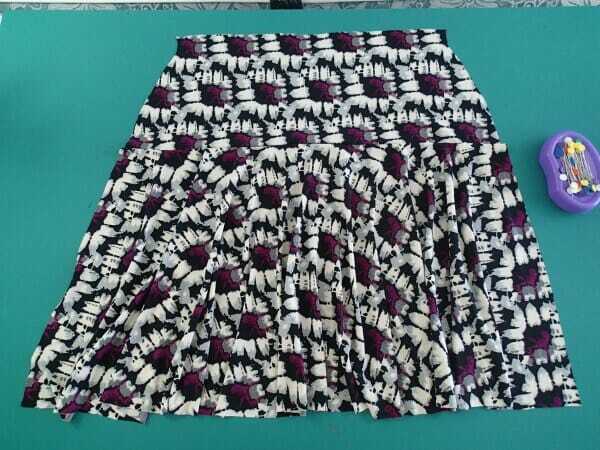 really nice skirt have tried a few of your patterns and had a good response thank you i have just started sewing i am 70 years old and so glad i found your site. Welcome Maggie, great to hear you’ve taken up a new hobby. It’s never too late! And having success with it too I hear. Makes me happy to hear you are enjoying sewing with my patterns. Keep it up! Amazing! This is just the skirt I wanted to make for the summer. I was going to borrow a friend’s and try to copy it (talk about a disaster in the making! ), and along came this wonderful pattern from you. What a treat! Thank you, Deby. Thanks “sew” much Deby and Happy Mothers Day to you!! Deby, thanks so much for another great project! Can’t wait to make one (or more!) for summer. Dear Deby, thank you so much for the lovely skirt patter!! Thank you Claudia. I hope you like it, I’ve barely taken off my print one since I made it – so flouncy and fun to wear! Deby, this is very cute. Perfect for summer.